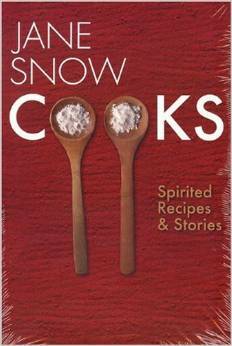 I participated in a cookbook exchange a while back, and I was pleased when I got a book I'd never heard of - Jane Snow Cooks by ... you guessed it ... Jane Snow. I'd never heard of her, but she's won James Beard awards and was the food editor of the Akron Beacon Journal. It's a pretty eclectic bunch of recipes, published in what seems to be random order. But it was fun to browse through. I found one recipe that was weirdly intriguing. It was called Gus' Puffs, and it was apparently one of the most popular cocktail snacks in Akron. I figured I'd give it a try, and then I made it again the next day, with a slight variation - I used a few scallions along with the regular onion to add a little color. It still seems like a weird combination, but it's pretty darned tasty. And very retro. And very adaptable. Like I said, I used some scallions on the second try, but you could also add herbs, sundried tomatoes, chopped olives, or whatever makes sense. Change the cheese, if you like. Use caramelized onions, or add some roasted garlic or fire-roasted red peppers. The recipe called for cutting a circle of bread from each slice, which would be nicer for a party, but I just trimmed the crusts off the bread and cut it into rectangles. Less bread waste and more snacking. If you're making these for a themed party, you could also use a cookie cutter to cut the bread into shapes to match the theme. Or, if you happen to have bread molds to make canape bread, you could make your own bread in the molds and then all you need to do is slice it. Or... buy cocktail rye bread. That would be pretty good, too. Trim the crusts off the bread and cut into triangles or squares, or use a biscuit cutter or cookie cutter for other shapes. Place on a cookie sheet and place under your oven's broiler to toast the first side. Watch carefully - it's fast. Remove from the oven and flip the slices over. Mix half of the cheese with the mayonnaise and onion. Slather the mixture onto the bread slices and sprinkle with the reserved half of the cheese. Place in the oven under the broiler and cook just long enough for the puffs are golden. They will puff up a bit, thus the name.